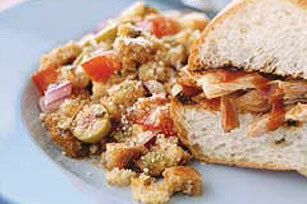 We slashed the prep time of traditional Italian bread salad by using one secret ingredient. But we're lousy at keeping secrets: It's STOVE TOP Stuffing! Add hot water to stuffing mix in large bowl; stir just until moistened. Cover; let stand 5 min. Use the freshest tomatoes and onions available from your summer garden or a farmers' market!